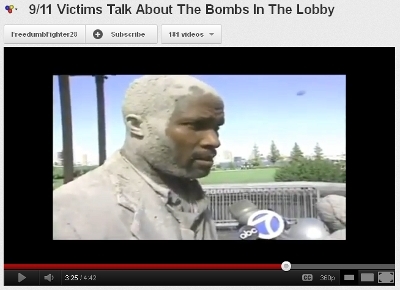 Another graphic depiction of real 911 victims..the horror! "The 9/11 picture I'll never forget (but wish I could)"
If only there had been hijacked planes that crashed into buildings packed to the gills with people. Then, maybe those gurneys wouldn't be so damn lonely. But hey, at least they had all of the starched whites ready for duty, right? Wish we had an unphotoshopped picture available of inside any of those ambulances. How many medics were with each vicsim? What were their injuries? X-rays? Bloodwork? It is just AMAZING that not one nurse, doctor, ORDERLY, lunch lady, custodian and/or laundry person at any hospital receiving vicsims has said anything about it. No vicsims showing their scars. No people who were waiting in the emergency department for a bladder infection or fall allergy shots saw anything. Did all of the vicsims have private rooms? Did all of the vicsims have vicsim roommates? No giftshop purchases? No vicsims toting their IV poles going for a smoke? No vicsims toting their IV poles to the cafeteria? No visitors to see the vicsims? No sign ins? No calling of priests (other than the "dead one" Father Mychal) to give last rights? CTGal1011 wrote: Did all of the vicsims have private rooms? Did all of the vicsims have vicsim roommates? No giftshop purchases? No vicsims toting their IV poles going for a smoke? No vicsims toting their IV poles to the cafeteria? No visitors to see the vicsims? No sign ins? No calling of priests (other than the "dead one" Father Mychal) to give last rights? You are talking about sim-wounded, but I think the "wounded" side of the scam was deliberately and blatantly expunged from the psyop. They never even pretended there were civilians wounded anywhere, which, obviously, is an absurdity. Imagine all that debris raining down on manhattan in reality (in an environment not perfectly evacuated in advance, and with a demolition not perfectly under control) how many wounded would have created. But it makes sense. I think this simplified the difficult work of controlling the staffs at the hospitals, on top of controlling firefighters and police. If it is true that firefighters and police are often in masonic groups, like I have been reading somewhere, it seems unlikely that all doctors or orderly staff are too. Better to keep em out of the loop. They probably busied themselves with real people in shock for the events, on top of a normal routine, on top of handling the thousands of citizens apparently donating unnecessary blood. At 16secs: "People have seen the pictures"
At 21secs: "NO ONE CAME". At 1min:30: "They're ready for patients...they're ready for patients...if some could be brought to them..."
Quite simply, there were NO injured - because the WTC complex was an empty/fully evacuated area - therefore NO ONE got hurt. You know, when you plan to demolish buildings, people are NOT supposed to hang around anywhere near those buildings. It is just common safety measures to NOT LET ANYONE INTO A DEMOLITION AREA. This is the way it has always been - for EVERY PROFESSIONAL DEMOLITION JOB in the history of this world. 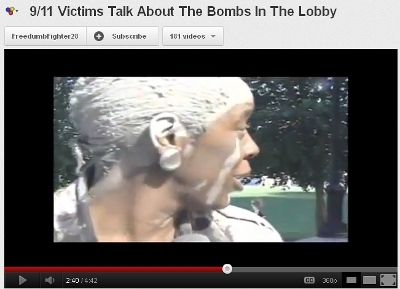 Let us not forget it was the same scene at the Pentagon....look at the commotion in the background. "No fatalities to speak of"
Isn't it funny how, after years of 9/11 Vicsim research (and 60 long pages of this thread alone) we are now left looking at the alleged survivors - having found NO EVIDENCE for anyone of the VICTIMS to have existed? But hey - let's assume that these survivors DO exist (and are traceable, flesh-and-bone individuals, liable to be ruled to appear in a future court of law ). In this case, we should start listing them, one by one. I suggest we start doing just that. "Keating Crown" - is my first (new) entry - we've heard, of course. of a few more of them (as spread around this forum). Here's another survivor story, featuring "Ken Summers"
Utah, this article has to be some kind of parody. The sheer number of suspicious aspects in the reported story is crazy, the writer appears to be deliberately pointing-up the impossibility of this woman's story. Who else agrees? If this were to be used in some kind of pre-trial hearing (as per Simon's comment above) it would be shredded in seconds - assuming proper objective tests of evidence and real standards of justice were being applied. 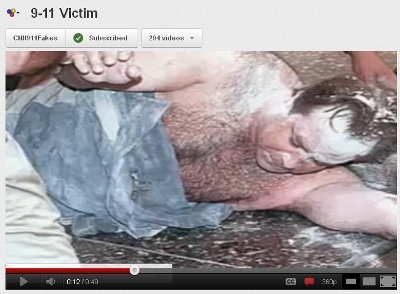 How does survivor "Ken Summers" story destroy the VICSIM postulation, is he dead? 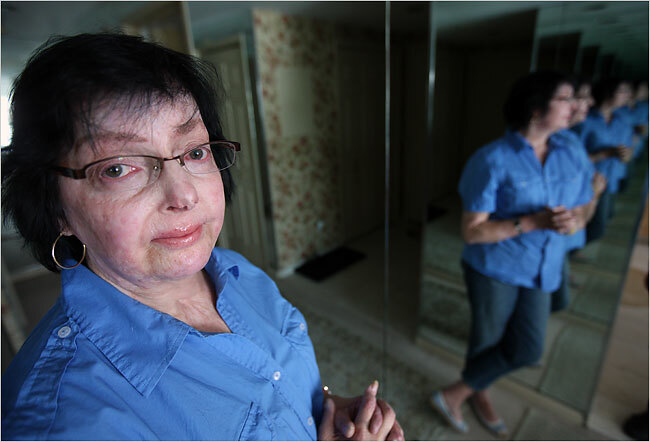 nonhocapito wrote: I think the "wounded" side of the scam was deliberately and blatantly expunged from the psyop. They never even pretended there were civilians wounded anywhere, which, obviously, is an absurdity. Imagine all that debris raining down on manhattan in reality (in an environment not perfectly evacuated in advance, and with a demolition not perfectly under control) how many wounded would have created. 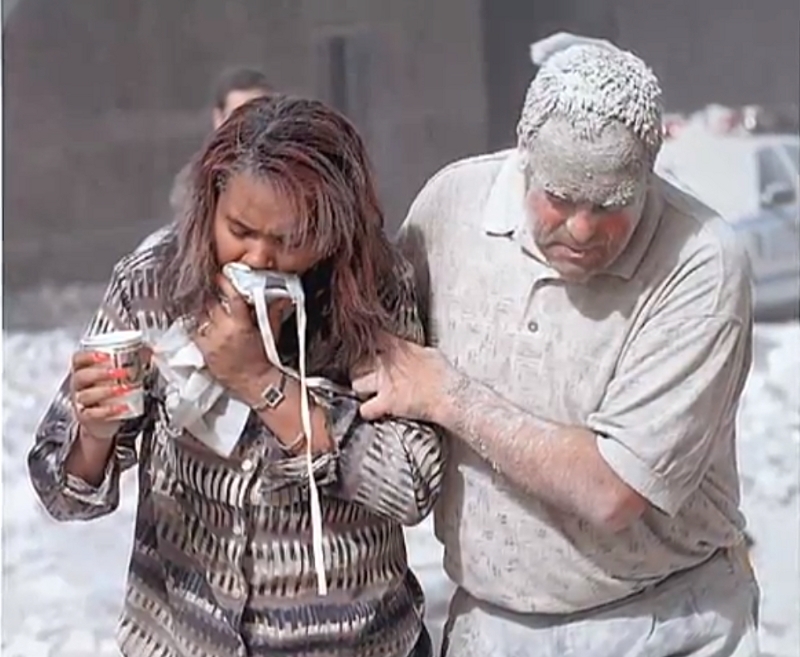 Nothing earth-shattering here: More "never before released " 911 footage that looks like dramatic re-enactments and training exercises, a few dubious shots of 'wounded', and a handful of hospital staff and 'survivors' acting out the drama for the masses. Last edited by Utah on Wed Apr 18, 2012 3:27 am, edited 2 times in total. In fact I must correct my previous statement: Some wounded stories were given, even very early, obviously. But it is clear that, regarding what was happening in the hospitals, the psyop had to contain the drama and not even try to enact the arrival of wounded people to real hospitals requiring actual medical staff to lie about it, pretending to be overwhelmed by them. Instead, all they had were a few scenes filmed in studio showing the same few actors in hospital pajamas. Notice how they placed the "Bellevue" sign behind her in case we wanted to doubt she was really there. How would that ever happen in reality? The following one, from NBC, is famously hilarious for the incredibly bad acting, and the atrociously bad video quality -- for no apparent reason. The third video is from CBS, must also be "from Bellevue", and also features one of the same actors from the previous video, "Arthur del Bianco" (whom we see "reunited with his wife" ). This video reassures us of the line given by the psyop: hospitals are not receiving wounded because there are none. 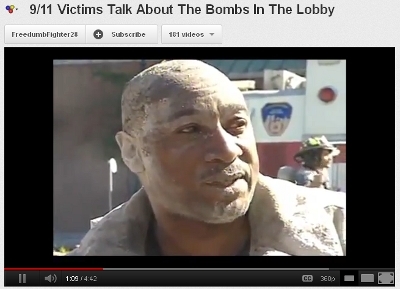 (Not surprising to note how all these videos were and are still largely used to fuel fake "truther" theories about the "inside job" and the "explosions", as if the accounts were authentic. This is understandable, since nothing is given for nothing: I am giving you a few crumbs of conspiracy, as long as you believe these people were really wounded and escaped from the collapsing WTC. nonhocapito wrote: all they had were a few scenes filmed in studio showing the same few actors in hospital pajamas. It does seem rather pathetic given our perpsective today, doesn't it? This is best they came up with ? Obviously, they never anticipated the level of scrutiny we are now bringing to the table. No wonder they are trying to change tactics with the "hordes of injured" story put forth in the 911 ER piece. Well, to be fair, it is television, and news is always staged as entertainment, even in the case when its not total BS. Bellevue Hospital is an amusing choice.The name is synomous with mental instablity for many New Yorkers and Woody Allen fans. Maybe our perps have sense of humor. Or were the 'survivors' driven mad by the silliness of it all? nonhocapito wrote: (Not surprising to note how all these videos were and are still largely used to fuel fake "truther" theories about the "inside job" and the "explosions", as if the accounts were authentic. This is understandable, since nothing is given for nothing: I am giving you a few crumbs of conspiracy, as long as you believe these people were really wounded and escaped from the collapsing WTC.